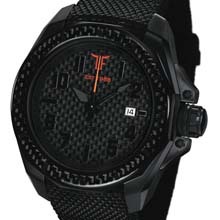 T-Fun Collection, colourful and bang-on-trend watches, genuine carbon finish. Enjoying worldwide distribution thanks to its famous cufflinks housing a Tourbillon style watchmaking mechanism, the lifestyle brand TF Est.1968 has moved into the field of watchmaking armed with some highly convincing arguments and a particularly seductive colour palette, not to mention attention-grabbing aesthetics. 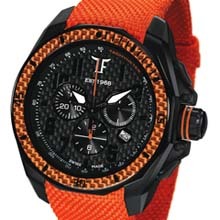 A member of the mechanical family, the T-Fun automatic, water-resistant to 150 metres, 45 mm in diameter In an exceptional move for a mechanical timepiece available at an incredibly affordable price that will test anyone’s powers of resistance, this T-Fun timepiece houses a 100% Swiss made decorated and circulargrained, Côtes de Genève finished three-hand automatic calibre. Personalised down to the surfaces of its oscillating weight, the movement is open to view through a transparent back. Fitted with a sapphire crystal with anti-reflective coating, water-resistant to 15 atm, the case crafted in 916L steel or 5N gold plate transcends even the eye-grabbing chocolate brown and apple green colour scheme, shot through with flashes of vivid orange or white. Genuine carbon coats the dial and the circular grained matching bezel. The virile screw-down crown, struck with the identity-rich TF logo, makes a proud linear statement. > Swiss made automatic calibre, Côtes de Genève finish and circular-grained decoration, personalised oscillating weight open to view through the transparent back. Screw-down crown. T-Fun chronograph watches, sporty timepieces, 45 mm in diameter, bold colours, seductive aesthetics, water-resistant to 150 metres!!! > The T-Fun collection goes for bold colour pops for the chronograph version, making it sporty and aesthetically desirable. Highly luminescent indices and logo, sapphire crystal with anti-reflective coating, Swiss Ronda quartz movement, screw-down crown struck with the TF logo, matching carbon back and bezel, water-resistant to 150 m. Comes with 2 straps: felt-touch rubber strap and NATO style nylon strap.